Athens High School senior Parker Minier has been around welding most of his life, helping buddies fix equipment and working on farms for people he knows. He even has a welding setup at home. So when the opportunity came during his sophomore year to sign up for the Industrial Welding Program at Kellogg Community College, Minier jumped at the chance. Minier, 17, of Athens, is dual enrolling at KCC through the Calhoun Area Career Center and KCC’s early college program. He walked at commencement with his high school class last month, will continue training at KCC this summer and fall and graduate from KCC with an Associate in Applied Science degree in Industrial Welding in December. Minier says his welding training — which he completes at KCC’s Regional Manufacturing Technology Center campus in Battle Creek’s Fort Custer Industrial Park — has also helped him out in his job doing fabrication and repairs on a family farm in Athens. “I can definitely tell improvements in quality,” he says. 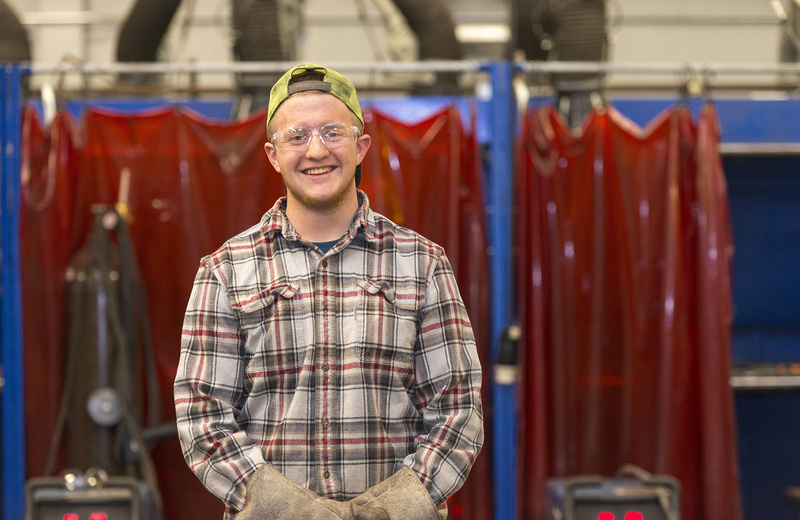 In addition to learning about and practicing welding at KCC, Minier also takes electives through KCC’s Industrial Electricity and Electronics Program, and plans to continue his education in the field after graduation, possibly even through an apprenticeship. But the welding training he has through KCC gives him options in the meantime. Interested in early college at KCC? Talk to your high school counselor about early college opportunities, visit www.kellogg.edu/earlycollege or contact KCC at 269-565-2042 or dualenrollment@kellogg.edu for more information.